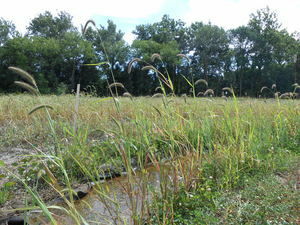 Notre Dame’s Linked Experimental Ecosystem Facility has been operational for just a few months, but already hydrology, ecology, and environmental DNA experiments are underway. On September 29, from 1:00 to 4:00 pm, the public will have a chance to learn about the experimental watershed at ND-LEEF’s first annual Science Sunday. ND-LEEF is located on 28 acres leased from St. Patrick’s County Park. The facility is designed to allow researchers to conduct experiments on a watershed level that are highly controllable and replicable. So far, two experimental watersheds have been built, and there is enough room to build 12 watersheds eventually. Water is pumped out of the ground and into an aeration pond, where it is warmed and much of the iron settles out. From there, the water is piped to each constructed watershed. A valve enables researchers to adjust the flow rate into each stream. Probes embedded under the streams record temperature and water level, which is then transmitted wirelessly to the researchers. 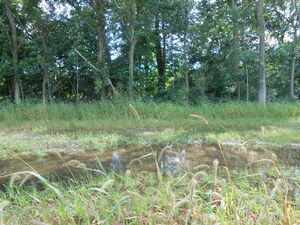 From the stream, the water flows to a small lake and then is filtered through a wetland. In addition, a studio class taught by Prof. Aimee Buccellato at the School of Architecture has utilized ND-LEEF as an inspiration for design projects for the last three years. Each class is challenged with designing buildings for the facility with a variety of constraints, such as recirculating computer heat to warm the buildings or utilizing salvaged building materials. Plans have been developed for classroom space and a greenhouse as well. The entrance to ND-LEEF is off Laurel Rd. between the main park gate and the Park Gate House. The Science Sunday program is free of charge and will include hands-on exhibits for children to learn about aquatic life and water flow.